Frequent readers of this blog know we have become very dependent upon satellite communications. 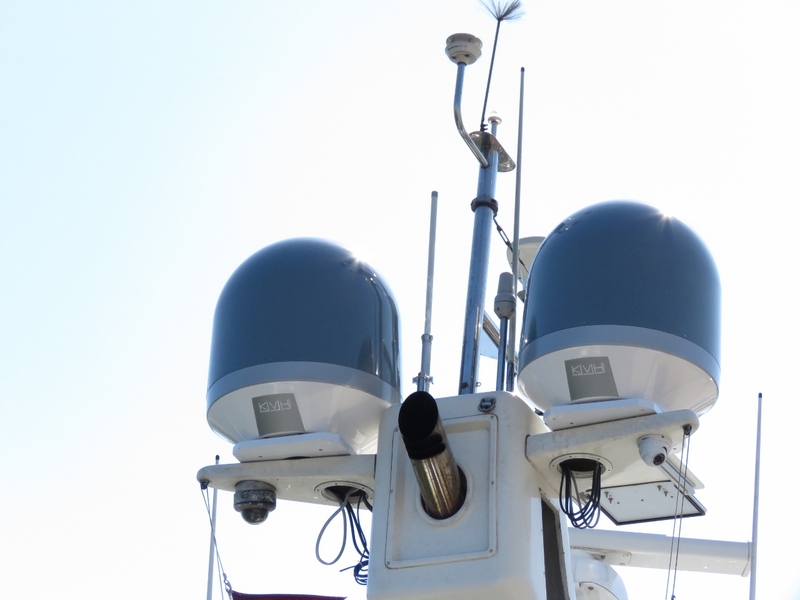 In fact, we have three different satellite technologies on board Dirona, as described in Communications at Sea. Here, we complete a quick survey of the satellite systems on Dirona, our experience with them, and why we upgraded to the KVH V7-HTS system four months ago. Our primary system is a KVH V7-HTS mini-VSAT, but we also have Inmarsat BGAN and Iridium. We favor the KVH system because the service is excellent and the data rates are very good. We use Inmarsat BGAN when we are in a part of the world not covered by the KVH system or if there has been a system outage. At $6,000/GB, BGAN data transfer is 30x more expensive than KVH, so we only use BGAN when there is absolutely no other choice. Both the KVH mini-VSAT and the BGAN systems are line-of-site geo-synchronous satellite systems. Our third satellite system, Iridium, is based upon a large constellation of low earth orbiting satellites and, as a consequence, their coverage is global. The entire planet is covered, including both polar regions not reachable from line-of-site geo-synchronous satellite systems. Initially we used the Iridium system both as a backup to our other two satellite options and for voice calls. The Iridium voice calls are actually more expensive than using our V7 but, since you have to pre-purchase Iridium usage minutes so it’s ready to use in an emergency and since these minutes expire quickly, the phone calls are effectively free unless you spend a truly large amount of time on the phone. Ironically, even with the Iridium calls being effectively free, we now use our KVH V7-HTS exclusively for voice calls because it’s inexpensive, the call quality is so much higher than the Iridium, and it doesn’t experience the frequent call drop-outs of the Iridium system due to failed inter-satellite call transfers. Satellite communications are one of our most mission critical components after safety equipment on Dirona. Without satellite communications, I would not be able to be working remotely, we wouldn’t be able to do trip planning in remote locations, maintaining the boat would be much more difficult in remote locations, remote help would be more difficult to arrange, and even maintaining this blog would be considerably more constrained. Our initial decision to rely on satellite communications was driven by work requirements but, over the years, we have become more and more dependent on satellite communications across all aspects of our lives. If I were to stop working to focus more on the trip, we wouldn’t stop using the satellite systems. Having 24×7 communications is part of what makes the trip enjoyable. But satellite systems are far from perfect. For us, roughly in the order of importance, the primary challenges of satellite communications are: 1) data transfer costs and overage charges, 2) coverage area, and 3) speed. It was improvements across all three of these dimensions that led us to upgrade to the new KVH V7-HTS (High Throughput Satellite) system announced October 31st of 2017 at the Fort Lauderdale International Boat Show (FLIBS). We have been KVH users since 2012 and our V7 system was operating reliably, so there was no need to upgrade. What made the upgrade difficult to resist was the new system has an additional 25 million square miles of coverage. Because we are so dependent on satellite connectivity and our backup systems are 30 times more expensive, we hate passing through coverage holes. If you look closely at the V7-HTS coverage map at the top of this post, you’ll see the holes we have worked through in the past across the Indian and southern Atlantic oceans are now fully covered and there are small coverage improvements in other areas of the globe. 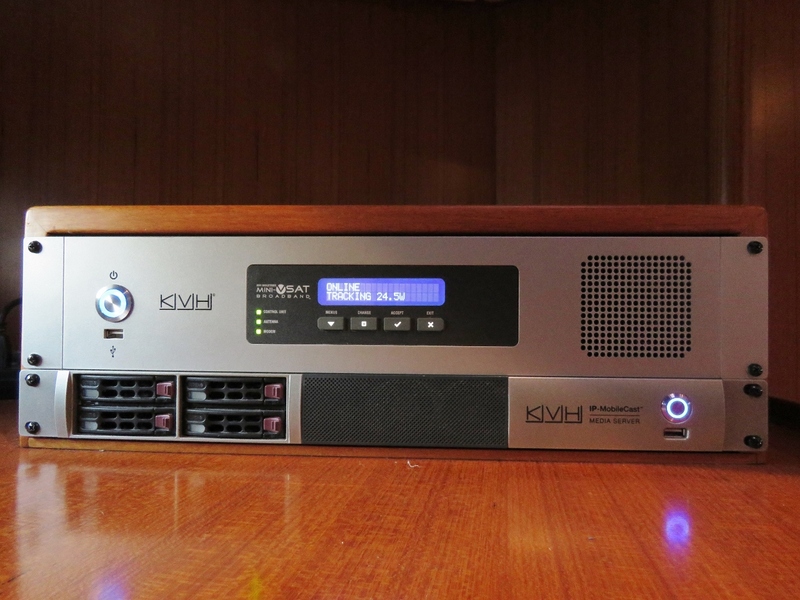 Coverage alone might have pushed us towards upgrading to the KVH V7-HTS system, but twice the bandwidth at no additional cost was another big driver. The HTS can deliver 10Mbps down and 3Mbps up whereas the previous generations were half that bandwidth. This is actually faster than some of the cellular systems we have used over the years in our world travels. And these high data rates appear to be less contended and more reliably available than many cellular systems. There have been times when I’m trying to get something important done at work and I’ll switch from cellular to satellite because the satellite system was actually running faster or working more reliably at that point in time. If doing work dependent upon web searching, online documents, or even when doing trip planning, having high bandwidth communications can really make a big difference to overall efficiency. The V7-HTS 10Mbps down and 3Mbps up is pretty compelling. The last advantage that pushed us to upgrade from a perfectly good V7 mini-VSAT system to the newest KVH V7-HST equipment was the unlimited channel. This is a particularly innovative offering where a very slow but no-charge channel is always available for less-urgent, low-bandwidth work without additional cost. When web searching, filling out forms, reading online documents, or moving video, the high speed channel is very fast and efficient. But, there is some traffic that isn’t urgent, does need to eventually happen, but really doesn’t need the capabilities or the cost of the high speed channel. For example, we frequently post to this web site pictures, boat location, weather, fuel reserves, and boat status (http://mvdirona.com/maps). If this data arrives 5 minutes later, it doesn’t slow us down nor does it cause web site readers problems. Another lower priority class of data is Windows/Android update. The world is increasingly under cyber attack so it’s wise to keep systems at the latest patch levels, but patching can consume a lot of valuable bandwidth. This is an excellent application of the unlimited channel. Each V7-HTS data plan includes a fixed allocation of high speed data (10Mbps down/3Mbps up) as well as an unlimited but very slow channel that is suitable for low priority tasks that need to happen sometime but not urgently. All high speed plans come with a no-charge unlimited channel (UL) with 128Kbps down and 64kbps up. This is incredibly slow and it would be completely frustrating for web surfing but it’s great for background work like patching an Android or publishing content to our web site. There are usage limits and site such as YouTube are blocked but, even with the constraints and limitations, we have found it quite useful and have become fairly dependent upon the UL channel. It allows us to make trip data available that we previously wouldn’t have posted due to the satellite connectivity costs. For those who already have the previous generation of KVH V7, the upgrade to V7-HTS is $10,000 . So it’s not cheap but, at least for us, satellite communications rank right up there surprisingly close to life critical safety equipment. The combination of 25 million more square miles of coverage, twice the bandwidth, and the unlimited channel just about forced us to upgrade to the V7-HTS. In the four months since, we have been very happy with the system. Pretty interesting development. KVH is certainly not resting on its laurels and continues to improve its offering. One simple question how do you physically select between/ recognize Hi-speed and Lo-speed traffic channels? Manual switching ? It’s a good question Jacques. The common approach is to use two seperate networks where one is on the V7hts High Speed (HS) channel and the other is on the V7hts Unlimited (UL) channel. Crew is put on one and owners on the other or less real time critical devices are put on UL and the rest are on HS. Another approach good for small boats is to put in a single boat network but to have a hard switch somewhere on the boat that can switch the WAN port of the router between ports on the V7hts system. The switch moves the entire network between HS and UL modes. This is an easy and flexible approach and is probably what I would recommend for small boats. 1) Full Boat Switch: The boat has 4 WAN implemented and chooses the first available in one of two modes: 1) “restricted” where it choses the first of: a) WiFi, b) Cell, and c) V7hts UL, and 2) “full” mode where the router chooses the first of: a) WiFi, b) Cell, and c) V7hgts HS. 2) Special Traffic: Some traffic that is not time critical like updates to our web site are always sent through the V7hts UL channel. 3) Device Specific: Single devices can be placed in UL while the rest of the boat runs on any of the other WANs. We really like the system and, as you can see, have already fairly deeply integrated it into how we operate Dirona. I knew the answer would be “smart”….I just wanted to know what it was! ;-) Thanks James! Many moons ago we had a 256/128 Kb/s link at home, and with three people in the house it got pretty sluggish at times. So I slapped a box running an Ethernet bridge in between our router and the household network, and over the course of a couple of weeks worth of tinkering implemented some traffic shaping. One of the flatmates wandered into the room one day and declared that my traffic shaping was messing up his internet and would I please turn it off, so I did so. Less than 2 mins later he was back. He’d discovered that the traffic shaping was actually making the problem which lay elsewhere much less severe, and wanted me to turn it back on again. By the time a few cost reductions etc had us at 1.5Mb/s downstream, it wasn’t worth maintaining it any more. Nice application of traffic shaping. Our approach is slightly different in that we have four very different WANs to choose from so we do more in that area and we do a bit less than you did in traffic shaping. Thanks for this… I wish there was a reasonable alternative for handheld voice and data beyond iridium, but there really is not… I am about to purchase an iridium phone as I use it when boating offshore and when I am hunting Elk in the mountains of Colorado. I actually see a fair number of SUVs with the flat KVH system for cars, but that just ain’t portable..
Yeah, I agree with you Matt. I still have an Iridium and pay for it to be usable even though I don’t ever use it. It’s there “just in case” and it’s still worth maintaining the plan for when you need hand-held connectivity or when geo-synchronous satellites our out of site (e.g. polar regions). James and Jennifer – as usual, a super helpful guide through the murky world of satcom. Thank you! Hi Don. You are right there are a lot of options and considerable complexity in the satelite communications area but the good news is high speed communications are getting less expensive. When we left Hawaii for the trip around the world, BGAN was a booming $8,000/GB (cellular bandwidth is usually around $10/GB). BGAN is now down to $6,000/GB but still crazy expensive. It’s fast but really expensive. The newest mini-VSAT system from KVH is more than 10x faster at 10Mbps down and yet only $200/GB. Still not cheap but, if you have a need for high speed communications away from civilization, it’s pretty good value. Great post on these complex communications systems James. I am so glad you keeping sharing your experiences and technological expertise with us. This is giving us all great information that will make our own boating much safer. Wishing you calm seas and more fantastic travels. Thanks Stewart. We’ll probably drag ourselves out of London and start heading north in another couple of weeks. We’re looking forward to Norway but are still loving London. It’s an amazing city.